We live in times where the idea of human consciousness uploaded into digital form, a type of virtual immortality freed from our fleshly constraints, is spoken of as a near-future eventuality. To be honest, I believe this idea has always felt just around the corner, ever since the invention of the first "thinking machine." And for just as long, science fiction has enjoyed considering its implications. The latest foray into this field is a work by our modern horror master, Brian Evenson, who has written an homage to that greatest American science fiction writer, Gene Wolfe (not just my opinion, by the way). 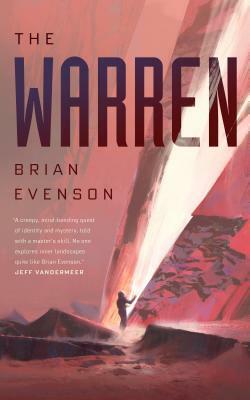 A man awakens in an underground facility called the Warren. Inquiring of the computer, he establishes a definition of a person, criteria which he does not fully meet. But who or what is he? He has the identities of more than one mind within his skull. Other selves there are, conceived of as pale eyes opening and watching. Other selves who know more things, or fewer things, or different things. One thing he learns though, is that there is another, a full person still alive and somewhere nearby. To get to him, he’ll have to go up to the forbidden surface.